I have been a strong proponent of responsibility to protect. When a country cannot stop massive abuses of its people, or it is perpetrating massive abuses of its people, then we have a responsibility in the world to react. We’re not even reacting; we’re just getting reports. First, we call on Canada to call what is happening to the Rohingya what it is, a genocide. Second, Canada has been among the most active nations to promote the international “Responsibility to Protect” principle. We urge Canada to implement “Responsibility to Protect” into its policy-making process in regards to Myanmar’s treatment of the Rohingya. Two decades ago, similar crimes of ethnic cleansing and extermination took place against Muslims in Kosovo. At that time, the international community acted to bring the killing to an end. Faced with a Security Council stalemate, NATO took the initiative with its own air campaign and established a precedent for intervention to protect innocent populations. That ultimately led to the adoption by UN member states in 2005 of the Responsibility to Protect principle, or R2P, which now applies in Myanmar. The Security Council must be reminded that when R2P was unanimously adopted, UN member states made a solemn commitment to prevent or stop mass atrocities, such as those taking place today in Myanmar. The council urgently needs to consider sanctions, embargoes and other measures that will bring pressure to bear on its government to stop the violence. One such opportunity presents itself in the call by the Bangladeshi Prime Minister Shaikh Hasina who has called for the safe zone for Rohingyas inside Myanmar protected by the UN peacekeeping force. We urge the Prime Minister, Mr. Justin Trudeau, to support this proposal by Bangladesh by committing peacekeeping troops with a mandate to defend and protect the Rohingya. Thirdly, an urgent meeting with the leader of France and Germany to develop a joint proposal for the protection of the Rohingyas. There is also an urgent and critical need for humanitarian assistance for the half a million Rohingya refugees. Almost 95% of all recent refugees are using bamboo sticks and plastic sheets for shelter in an extremely unhygienic situation. Most do not have proper access to food or medicine. Although Bangladeshi individuals are rushing to help and the government is trying to organize, the situation is very dire. We request that Canada airlifts tents, medicine, and food on an urgent basis. Canada should increase its assistance to at least $50 million dollars in emergency aid. We advise the Canadian government to provide a fleet of at least 5 transport helicopters that can take the urgent supplies from the airport to the remote areas since only a small tiny road serves as a critical artery for the area creating a logistical nightmare to reach to the refugees’ camps which require hours of walking. Lastly, there is a huge need to register newly arrived Rohingya refugees. Bangladesh has only allowed 30,000 Rohingyas to be registered as refugees. 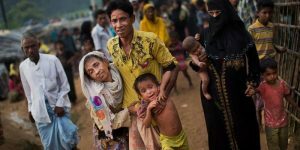 Canada should urge Bangladesh to register all Rohingya refugees and at the very least create a system by which Rohingya can document their losses, in life and property, for purposes of future investigations and restitution. We urge the Government of Canada to take up its traditional peacekeeping and humanitarian role, and set an example for other nations to follow, so that peace and justice may once again flow.